About Park View Road Welling United play their home matches at Park View Road, which has been their ground since 1977 when they took over the ground which had been vacated by the defunct Bexley United. 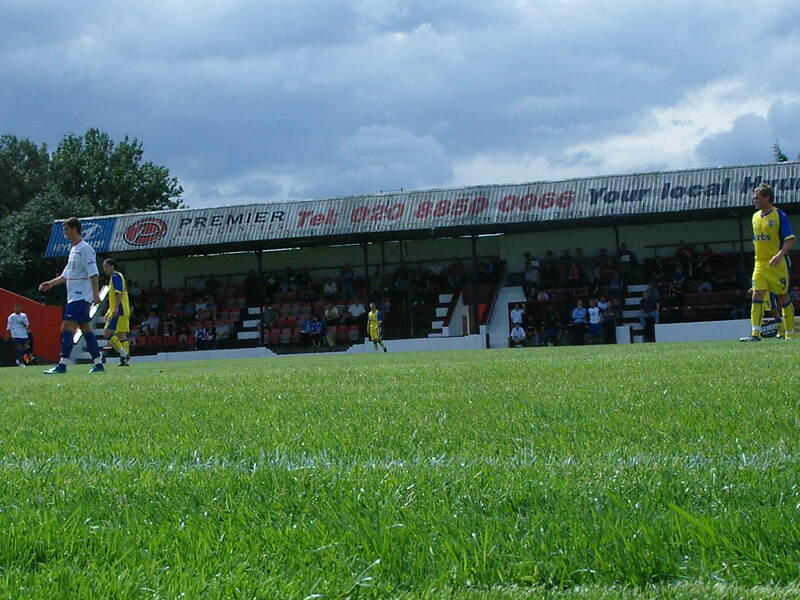 Prior to that date the club had played at a community sports ground in Butterfly Lane, Eltham. Having been unoccupied for some time, the new ground was almost derelict. In terms of non-league grounds it is actually quite good, framed by parklands at the south end and with a decent size main stand running two thirds of the length of the pitch. Space is tight so the terraces at each end are open and only a few steps. Erith & Belvedere have been ground sharing since the 1999 season. 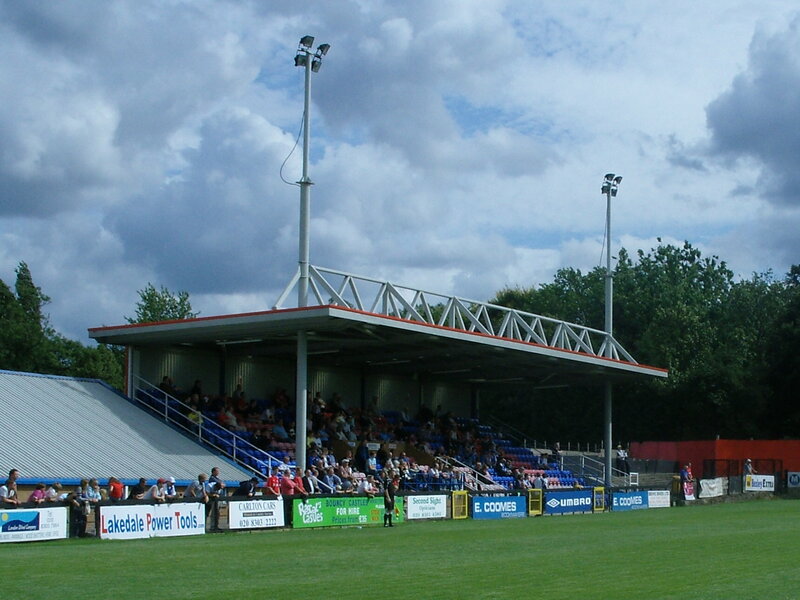 Improvements were made to the Park View Road ground in 2004, which included a new covered stand. As a result of severe storms and gale force winds in December 2006, the floodlights at Park View Road were damaged. Due to safety reasons all the floodlight pylons on the Welling side of the ground were removed. The floodlights were put in place during the month of June 2007 and are fully functional, one pylon positioned in each corne How to get to Park View Road By Road: If you are travelling from anywhere other than Kent, take the M25 to Junction 2. At the roundabout, take the A2 towards Central London. Leave the A2 at the third exit (Danson Interchange, signposted A221 to Bexleyheath and Sidcup). Turn right (second exit) at the roundabout at the end of the slip road, and then turn right (third exit) at the next roundabout. Go under the A2 bridge and up the slope to another roundabout. Take the second exit and follow the road (Danson Road) to the traffic lights at the end. Turn left at the lights onto Park View Road. The ground is on the left. There is no car park, but plenty of street parking is available. By Rail: The nearest station is Welling. Off-peak trains leave half hourly from both London Victoria and London Charing Cross (also calling at Waterloo East and London Bridge). From the station, go down the slope to the road at the bottom. Turn left and go to the end of the road. Turn left onto Bellegrove Road. This becomes Welling High Street and then Park View Road. The ground is on the right just after the Guy, Earl of Warwick pub; it is a 15-20 minute walk. If you wish to go by bus, numbers 89 and B16 run past the ground from the station. The above is provided by the club. How to get a ticket for Park View Road Apart from the annual pre-season game with Charlton Athletic and the occasional FA Cup run (although Welling have been unlucky in recent years that they always seem to be drawn away in the FA Cup), it is pay on the door at Park View Road as a capacity of 4,000 is amble for a club at this level. Adults – £15.00, Concessions (inc over 65’s) – £10.00 and Under 12’s (when accompanied by an Adult) – Free. Transfer to the seats in either stand is £1 extra. Our Last Visit – November 2013 The debate about the status of the Conference Premier has been raging for many years. Take a look at the league at the moment and you cannot fail to notice some very familiar names. Cambridge United were once a few minutes away from the top-level of English football and after what seems like years in the Non-League, are now leading the pack in the Skrill Premier. Not far behind them are fellow Football League exiles Grimsby Town, Luton Town, Kidderminster Harriers and Barnet. All of these clubs could essentially slot straight back into the world of the SkyBet, or whatever it is called, League tomorrow, competing on and off the pitch. Take a look at the average attendances in the league so far this season and the best eleven supported teams are all ex-League teams. In fact all of these apart from Halifax Town have a higher average attendance than Accrington Stanley, Dagenham & Redbridge and Morecambe (all of who were until recently, Non League sides). But there are a couple of new names appearing towards the top of the table. Alan Devonshire’s Braintree Town are punching well above their weight in 4th place, surviving on crowds of around a thousand. Salisbury City and Nuneaton Town are new-boys in the league but both have relatively good catchment areas, free from the distractions of bigger sides. And then there is Welling United. Sitting in ninth place in the league, just one win off fourth place, the Wings are enjoying life back in the top-level of Non-League football. Whilst they have been here before, from 1986 to 2000, the world of Non-League football has moved on, so their achievements in winning the Conference South last season was remarkable to say the least. I say that based on some local knowledge. Living just 4 miles away I have been a regular visitor at Park View Road over the years. 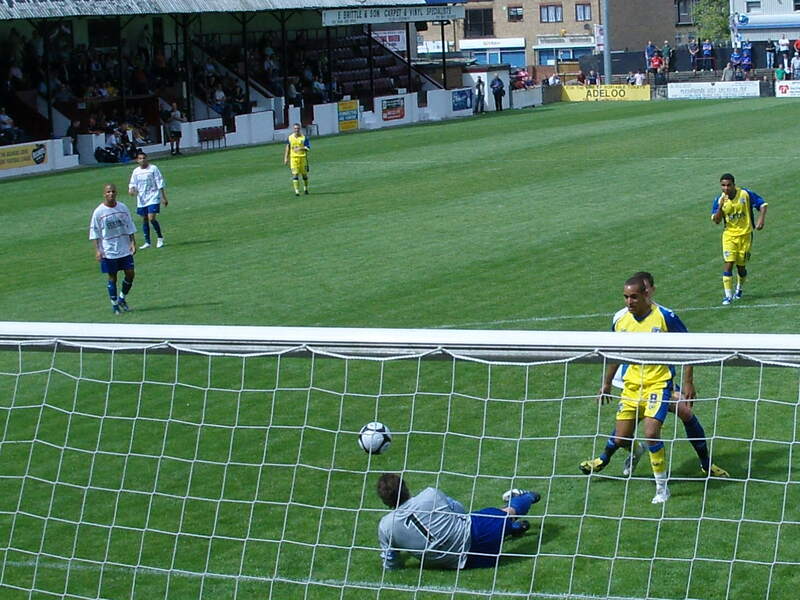 Earlier this year I was at the top of the table clash with Chelmsford City. Whilst Welling were demolishing a fellow title-contender on the pitch, off it were collection buckets encouraging fans to “dig deep” for Jamie Day’s, the player-manager’s budget. A year on from play-off final defeat away to Dartford, Welling won the Conference South and took their place with professional clubs who had tasted victory at Wembley when they were Football League sides. With average attendances of just over 800, few expected anything more than a season-long fight with relegation. Instead, impressive form at Park View Road has seen them already find their feet in an ultra-competitive league. Today was one of those strange days when your own side doesn’t have a game. 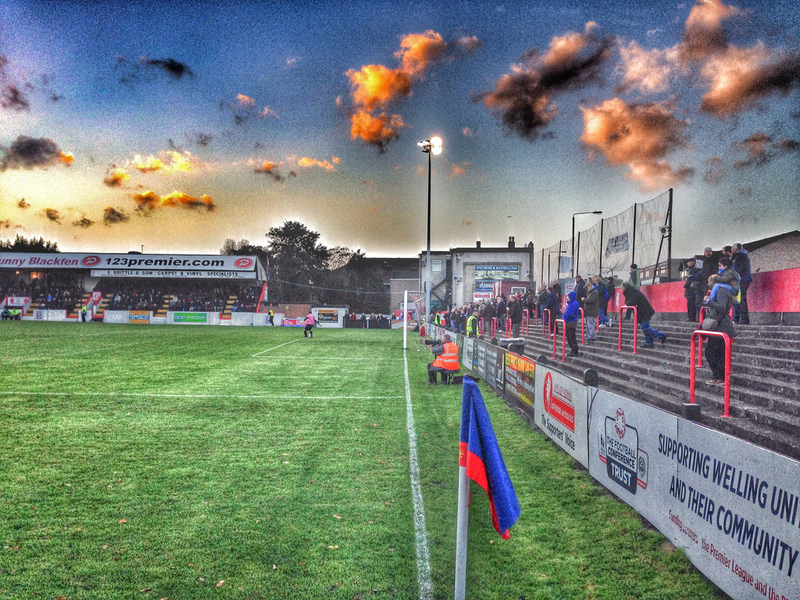 Due to Lewes’s exit in the FA Trophy at the first hurdle a few weeks ago we found ourselves without a game. A perfect opportunity to spread my wings and try somewhere new surely? Exactly – until Northern Steve decided to pay a visit. Northern Steve lives in Lincoln and is a Lincoln City/West Ham/Lewes fan. Coincidently, the Imps were playing at Welling United. Funny that. I gave him the option of paying £50 to go to Upton Park, but like me he isn’t a big Allardyce fan, nor one of 4-6-0 formations and so Welling was the choice. If you are coming to a Saturday game at Welling then you have to do it in style. So it was a no brainer that we would go to Crayford Dogs, have a few beers, hop on a bus to Welling and cheer on the Imps. Unfortunately, we were not going to be able to enjoy all of the delights of Park View Road. Welling had announced this would be a “segregated” game. I’m not sure if this was a club decision or one based on Police advice. 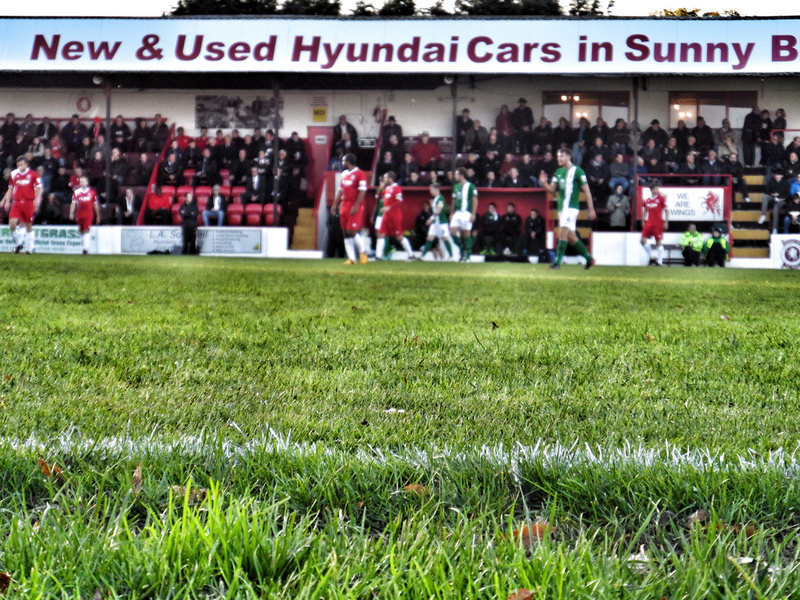 Many football fans choose non-league football because they are free from the restrictions of the modern game. Having a beer on the terrace and being able to change ends at half-time are two joys of the game at this level. Welling have never (as far back as I can remember) had an outdoor alcohol licence which I still fail to understand. Clubs like Lewes can serve beer outside but Welling can’t? Similar sized clubs and support. So are the footballing authorities being discriminatory based on the location of a club? People from East Sussex behave better after a beer than those of the London Borough of Bexley? Always a mystery to me. Lincoln were likely to bring a fair few fans so perhaps Welling felt it would be easier to “control” if the Imps were given half the ground. Whilst I can understand that, I do feel segregation for run-of-the-mill league games is anti-non-league. We arrived at 2.15pm and paid £15 (fifteen!) to get into the away bit. All around us were very glum away fans as the club house on this side of the ground was firmly locked shut. Across the ground the home fans were enjoying a special beer promotion yet the away fans had to make do with a cup of tea. Good to see fans being treated equal. A steward told us that the bar on this side was operated by Erith & Belvedere and they had said “someone might turn up to open it” but they hadn’t. On one hand clubs moan about lack of cash and fans attending games, and then you see situations like this. Let’s assume half of the 200 Lincoln fans bought one beer in the club house – that’s £600 for doing what exactly? 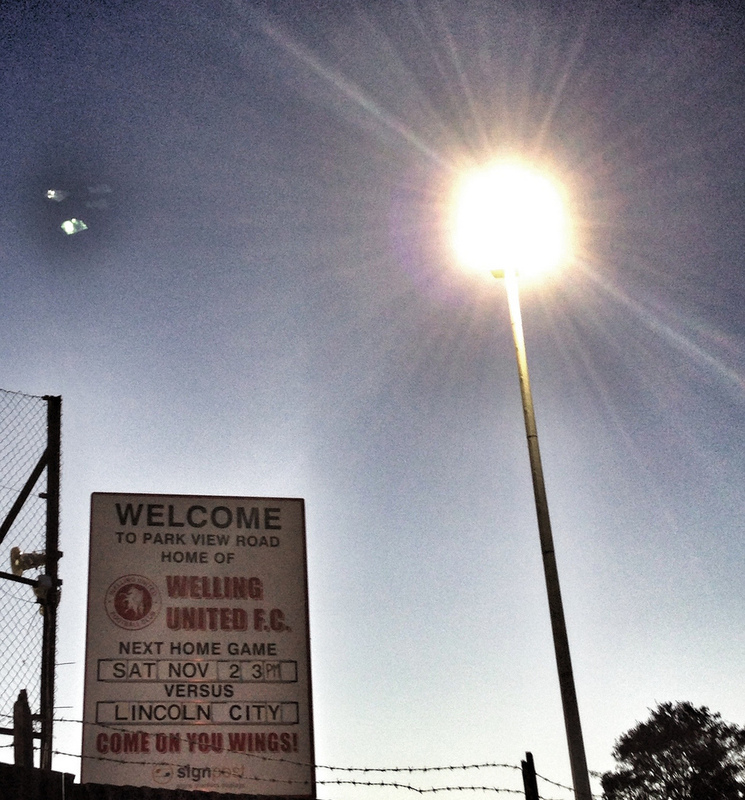 Welling United 1 Lincoln City 0 – Park View Road – Saturday 2nd November 2013 I don’t think this game will live in the memories for long. Despite both teams wanting to play attacking football, a petty refereeing performance killed the game as a spectacle by half time, leading to a second half that was as exciting as watching X Factor. Welling probably just shaded it and will be happy with the three points, delivered by Jake Gallagher not long after half time. Despite Welling’s keeper Lee Butcher being the busier of the two, he was only called into action on a couple of occasions. It was good to see that neither team had come to defend and Lincoln quickly found joy down the left hand side where Lincoln’s right back Franks was exposed for pace time and time again. Some desperate early defending kept the visitors out yet as the half went on it started to become clear that the referee wanted to be the centre of attention. Constant whistling for minor infringements, yet letter the more serious ones go unpunished frustrated both sets of fans. Whilst the 300 or so Welling fans got to change ends at half time after a trip to the bar, the away fans had to sit put, hoping that a long journey south would give them some reward. Alas it wasn’t to be. In the 52nd minute, Healy set up Gallagher who slotted the ball home from 10 yards. The away fans tried to raise the spirit of the team but after the goal they seemed to resign themselves to defeat, letting all of the positive attacking effort seen in the first half drift away. With ten minutes to go quite a few away fans headed for the exit, going in search of a beer to dull the pain. As the referee blew the full-time whistle virtually all of the Lincoln side couldn’t get off the pitch quick enough, completely ignoring the fans who had made the 150 mile trip down south. Three points for Welling took them up to seventh in the table, and just one point outside the play-offs. Despite the positivity on the pitch, home fans hadn’t exactly come out in numbers. This is Charlton Athletic territory and the Addicks were away in Birmingham so it’s hard to use that as mitigation. So what can the club do to attract more through the turnstiles? Living only 4 miles away I never seen any local marketing activity to encourage people to attend games. From my vantage position there didn’t seem many kids at the game, yet the club offer free admission to Under12’s – could that be marketed better in local schools (again, having a child in a school relatively locally it is all about Charlton)? There were around 200 people at the dog racing at Crayford just a couple of miles down the road on Saturday lunch time, and treble that in the evening. What about a joint marketing campaign with them? How many away fans will say they enjoyed the trip and will come again next season with the segregation and lack of a warm club house and a bar? Good luck to Welling for the rest of the season. Home form like this will ensure you will live to fight at this level next season. For Lincoln City? There is certainly something missing if they have short-term ambitions of a return to the Football League. With the league becoming harder and harder to get out of each season they may be facing a long, hard fight to return to the glory days of Wembley Play-off finals. Welling United 2 Gillingham 0 – 18th July 2009 Hands up who really goes to watch their local team? Genuinely local, not just “close” by. I would say less than 1% of football fans actually regularly watch a game at their local stadium. Look at West Ham for instance. A core of their support comes from Dagenham, where of course their local team would be Dagenham & Redbridge. Yet they head over to Upton Park rather than walking down Victoria Road. Liverpool and Everton, on the other hand draw most of their regular support from the local community despite the fact that they are global brands. However, it does take a special type of fan to become a regular at non-league level. A fan who can see through the crap football, crap stadium, crap food and drink and crap people in charge of their clubs deserves a medal. But there is a growing trend in support for these clubs and almost all of it is fuelled by local fans. I live in SE9, almost on the border of London and Kent. If I draw a line at the Blue Square level of the football pyramid my local teams (as the car drives) are Bromley FC – 5.2 miles (although as the crow flies this is only 3 miles), Charlton Athletic 3.7 miles, Millwall 5.9 miles and Welling United 2.7 miles. So my local team is Welling United. Well you may be surprised to know that I was a regular at Park View Road for two seasons a few years ago, with West Ham playing away on the days when they were at home. I grew to appreciate my Saturday afternoons at PVR, watching the likes of Phil Collins and Mike Rutherford (They did try to get Tony Banks down so that they could do a photo of the alternative Genesis) under the management of ex-Manchester United full back Paul Parker. Facilities were basic, but the crowd were loyal. I even had the pleasure on a couple of occasions of writing the official match report for the programme, such was my influence on club affairs. And then it all stopped. Primarily because West Ham’s games were always on the same day. but also because GiMP had decided to give the programme editing a kick into touch. Our desertion co-incided with the club’s wilderness years, as the club fell down the newly formed Blue Square South league, flirting with relegation to the Rymans league. Whilst the club are relatively young (only formed in 1963) they had actually played at the Conference level for a number of years and this would have been a reversal in fortunes for them. The club were actually formed essentially by a Sugar Daddy. Syd Hobbins, ex-Charlton Athletic goalkeeper formed a club for his son’s Graham and Barrie who have gone on to form a true one family dynasty. Barrie Hobbins is still at the club today, fulfilling the role of Kit Manager, Head Groundsman and Club Secretary as well as being a general miserable chap, wandering around the ground as if he had all of the cares in the world. The club played in number local youth leagues before they progressed through the non-leagues, gaining promotion to the Southern League in 1981. Five years later they were promoted to the Football Conference, the highest level they have played at. Whilst they never set the Conference alight they did keep a position in the league for nearly fifteen years. In 2000 they were relegated for the only time in their forty five year history, and eventually finishing in the top half of the Southern Premier League to gain a place in the Conference South when the leagues were restructured in 2004. Last season under Andy Ford the club looked for some time if they would make the final play off shake up but a final position of 7th was just two spots off a chance at the Conference again. They did inflict a rare home defeat on AFC Wimbledon late in the season, and this was a high point along with the goals of Charlie Sheringham (son of Teddy) who scored 19 goals. So why was I coming back? Well faced with the choice of Ice Age 3 or cutting the grass I chose neither. Danny and Cynical Dave (see the EFW team website) also faced a similar dilemma judging by their keenest to come down to the London Borough of Bexley on a dreary July day. Our plan was a few beers along the cultural hub of Park View Road, following the Route Of Wings (Wings is the nickname of the club) as they marched to this pre-season friendly. Not one to frequent Welling ( I have been there twice actually – once when I was cracking on to a lovely young lady I worked with in Lloyds Bank back in 1990, and once for Lolly’s birthday party three years – neither of which got me the apple pie I wanted) I tried to find a decent pub to start our session in. I went onto mecca for drinkers – Beer In The Evening website. Thirteen pubs were listed – good start, but the average score was just 4 out of 10 and didn’t exactly fill me with anticipation. The reviews of The Guy, the pub next to the ground included such platitudes as “place is shocking…..i too recommend you avoid………” and “Without the worst pub in the world not safe bad people etc etc a definite to avoid at all cost also big drug problem and locals looking for a fight at anytime of day or night – stay clear”. Gillingham were the visitors for the second pre-season friendly at Park View Road (called as such because it forms the north border of the lovely Danson Park). Every year the club welcome Charlton Athletic in early July. As a sign of the times this fixture had moved from a all ticket capacity affair to become a pay on the gate with room for plenty inside as the Addicks had slipped down the league. The club still stuck to sensible ticket prices, charging Adults just a tenner for entry for this one, and on a very pleasant Saturday afternoon, Danny, cynical Dave and myself wandered along the centre of South East London culture in Welling looking for some fans we could chat to. And we found none. We did find pints of Ruddles County in the Nags Head at just £1.90 a pint which was a nice surprise and stayed there until near kick off, enjoying the England batsmen’s humiliation of the aussie attack at Lords. In the ground the club bar was where the Gills fans who had travelled had taken up camp. A few hundred of them had driven up the A2, brimming with confidence for their forthcoming season in League One, and a chance to play some decent local games this season. League One has turned into a bit of the southern with two thirds of the teams playing south of Milton Keynes and the Gills were looking forward to Charlton Athletic amongst others. If truth be told (and it always is on TBIR) it was a classic pre-season game. Very little skill, players a bit wary to try something different for fear of the wrath of the managers and a few surprise performances. Welling decided to play in white, which was a bit of a surprise considering their normal Red didn’t clash with either Gillingham’s normal blue or the yellow they wore here. In an obvious commercial/marketing ploy they switched to a new blue shirt at half time. It would have been a good idea if they were trying to promote their new kit(s) if they actually opened the club shop to sell them! 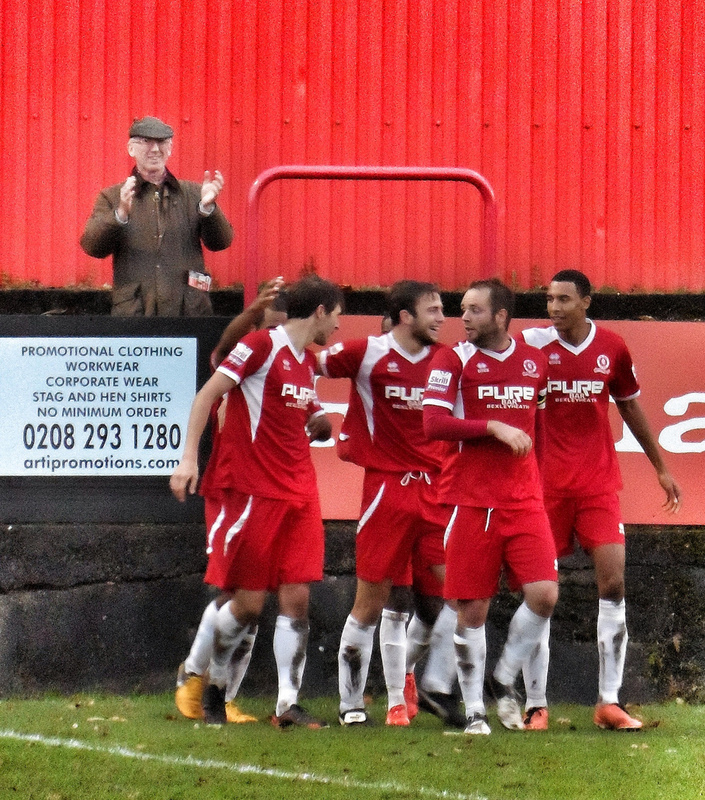 Welling deserved their win. Charlie Mitten in goal made some excellent saves, looking a very confident keeper and in midfield Sanchez Ming (brilliant name – should be half Mexican/half Chinese but wasn’t!) was busy and scored the opening goal, taking his chance with confidence after ex-Southend keeper Simon Royce could only parry a shot into his path. Their second, with five minutes to go came from an excellent run by Jake Hobbs who outpaced the defence and slotted home from a tight angle. It was hard to see what either manager could take from the game. Welling must be confident going into the Blue Square South season but with big spending Dover coming up, and Woking and Lewes sure to be focused on bouncing back to the Premier it may be that they need to aim for the Playoffs again. Gillingham on the other had will need to start the season strongly. Division One this season will be tough with the three teams who dropped down from the Championship in Norwich, Charlton and Southampton sure to be pushing hard as well as Leeds United desperate to end their two year exile from the Championship (and five from the Premier League!). The three of us wandered off, trying to find a pub with Sky in. The Nags Head was closed for a private function, “Infernos” was closed (permanently by the look of it – shame as I wanted to revisit the seat where I had so much luck all those years ago) so we ended up having one opposite in the Plough, with its 1970’s TV showing the golf – a very retro pub indeed. But full of local people doing local things. Shame they didn’t realise they had a local club down the road to support.